Hello my crafty friend! 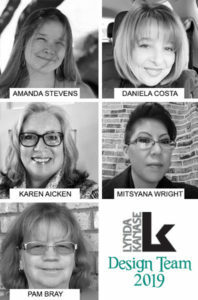 I’ve got some exciting news; I’ve been invited to join the Lynda Kanase design team!!! #squee If you’ve been following me, you’ve probably noticed I use her stamps and dies A LOT! I’m a big fan, so I’m beyond thrilled to join her team. 🙂 On the second Saturday of each month, we’ll have a blog hop focusing the spotlight on a new set designed by Lynda. This month, we’re showing you the Spring Things die set! It’s a fantastic set, full of floral layers, a pair of nesting labels, several hearts, and some critters. I’ve used it on quite a few projects already. (You can see them in use here and here.) And you’ll see them again in a few more cards that I haven’t shared yet. Some tips for wiper cards: You can adjust the size of your blade to suit your needs. Just make the distance between score lines on your card pieces the same width as the notch marks on your blade (in this case I have ½” between the folds and my notch is ½” from the edge of my blade). You also want to make sure the blade is a little wider than where you will notch it. You need that extra width to help the blade retract when you fold it back up. (In this case, my blade is 1″ wide. I could have made it thinner, but I needed it to be at least a little wider than ½” or it wouldn’t fold back into place when I push the sides back together.) You may be tempted to use acetate for the blade. It will work, but you will need an adhesive that really holds acetate well (like Super Tape) and be careful not to use really thick acetate. It can be brittle and sometimes the fold line will crack and break, instead of continuing to bend like cardstock. 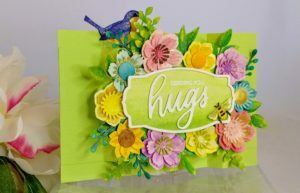 If you’d like to use the same supplies I did, you’ll need the Spring Things die set and a Big Shot (or similar machine). 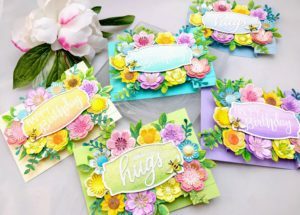 I painted the die cuts with my Prima watercolors (pastel, classic, and tropical palettes) and round no. 8 and no. 4 brushes. I added lots of shimmer with Tattered Angels Pearl Glimmer Mist and some Heidi Swapp Gold Color Shine. 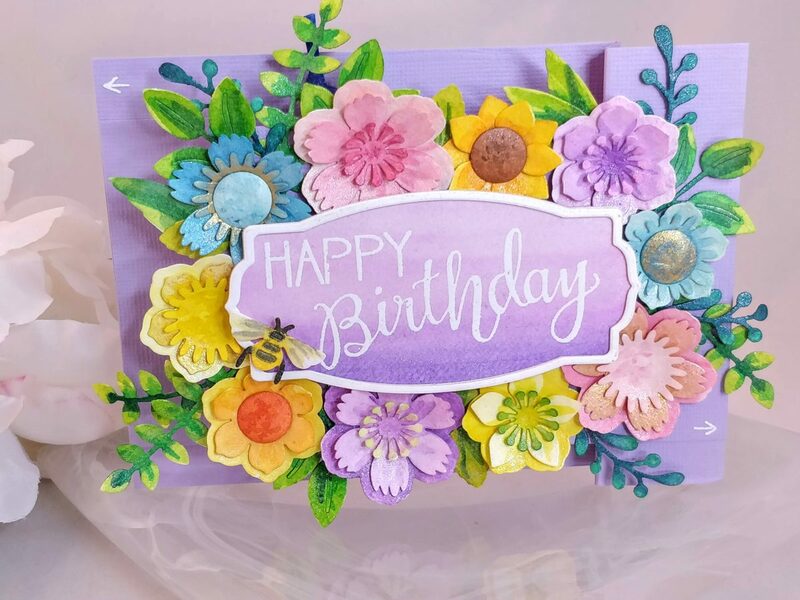 I stamped and embossed Happy Birthday with stamps from the coordinating Spring Phrases stamp set. For several of the cards, I changed the sentiment to read Sending You Hugs. I used this stamp set and die from Heffy Doodle for those. To add dimension to the flowers, I used a large tip stylus and the back of a mouse pad. Remember, you can use the end of a paintbrush, or even your fingers and the palm of your hand for this. To adhere the pieces together, I used a combination of foam tape and PVA glue in a Fineline bottle. If you choose to add white arrows to the sides of your card, you might want to use the same Posca pen I did. It’s a fabulous fine tipped paint pen and one of my favorite tools! So how do you like my little wiper card? I’m really happy with it and I’m glad I went ahead and cut out enough pieces to make a set of five while I had everything out. If I went too fast or missed anything, please don’t hesitate to ask in the comments below. And don’t forget to hop over to the other blogs in this month’s blog hop! The team has some gorgeous inspirational projects to share with you! Thanks for stopping by today! I hope I’ve inspired you to give wiper cards a try. If you do, please tag me when you post them on social media; I’d love to see and cheer you on! 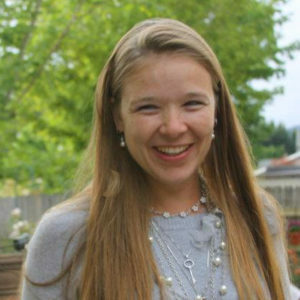 This site uses affiliate links whenever possible, but only for products I actually use and love! Omgoodness, these cards are just STUNNING. Love them! Beautiful, just love the interaction of the bluebird having fun in his garden! Love your gorgeous flowers! STUNNING collection of cards!! Congrats on the new DT; you more than deserve it!! Holy smokes, those are FABULOUS! Your cards are just so beautiful! You really brought this die set to life. So much so that I now have to go buy it!